I’ve been trying to accurately measure voltage for my open-source charge controller project. This project relies upon accurate measurement of voltage as this is used to control the regulator. I have been having some difficulty getting reliable and accurate voltage measurement, so I wanted to figure out why that was. I am using a simple potential divider to measure the voltage. This is being read by the 10-bit accuracy analog to digital converter (ADC). In this post I’m going to run through the options available to improve measurement accuracy. I have covered some of this in my voltage measurement post, but this post mainly relates to using the options within the microcontroller to improve accuracy. I’ve also included some Arduino code to automatically calibrate the Vref value and store it in EEPROM for use in other programs. I’m using the following circuit to measure voltage. This gives me some smoothing via the capacitor, over-voltage protection via the 5.1V zener diode and the resistors themselves reduce the input voltage to a useful range. Lets look into how we can improve the accuracy of the circuit. The resistors used for the potential divider have a specified tolerance, typically 1% or 5%. This means that a 1000 ohm resistor with a 5% tolerance, could have a value from 950 ohms to 1050 ohms. If the input is 10V then we should expect to see 10V *100k / (680k+100k) = 1.282V at the output. In the worst case for this potential divider, using 5% accuracy resistors then the 100k resistor could be 95k and the 680k resistor could be 714k. In this situation the output will be 10V x 95k / (95k + 714k) = 1.174V, which is 91.5% of the expected value, so out by 8.5%! For this circuit I am using the slightly more expensive 1% tolerance devices. 0.1% tolerance devices are available, but their cost is prohibitive in this case. 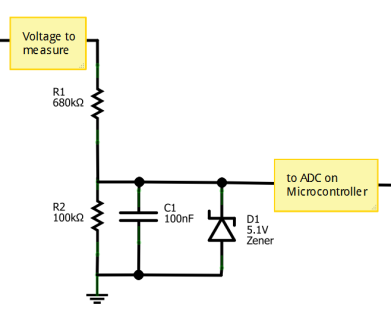 Another item relating to resistance, which I have just read in the data sheet, is the input impedance of the ADC input. This is designed to be optimal for around 10k input impedance. With a combined impedance of the 680k & 100k resistor network this will be much higher than the 10k suggested. This will mean that the capacitor used to do the ADC will take longer to fill and hence the ADC conversion time will be longer than optimal. In this case we do not want to add any additional components (due to cost and complexity), so we must make the most of the 1024 steps available to us in a 10 bit ADC. In default the ATmega328 will utilise the Aref, external reference, but the ATTiny25/45/85 will use the power supply line as the ADC reference voltage. The power supply voltage will be variable depending upon the load applied. This can cause some issues with accuracy. Generally it is best to have a precision reference, rather than a voltage which can vary with load applied. An external reference can also be used, applied to the Aref pin. This is standard for the ATmega328, but needs to be specified for the ATTiny25/45/85 and is applied to pin 5. Using an external reference will require the use of an extra external pin. This is not suitable for this design, but might be a way of performing accurate conversions. An internal reference of either 1.1V or 2.56V is available for both the ATmega328 and the ATtiny25/45/85. This seems like the most suitable way of performing an accurate voltage conversion. In order to use the internal reference we must have some form of calibration procedure performed for each IC. To do this I needed to calculate the actual Vref for each device. I decided to store the data in EEPROM in places 126 and 127. Two locations are required as each location can only hold one byte each. These locations were chosen as they are available for each form of ATTiny IC, as the ATTiny25 only has 128 bytes of EEPROM. For 2.56V reference this can be from 2.3 to 2.8V. A constant and accurate reference is applied to pin 7 (A1). This code is designed to take in 100 samples of the analog input. This will give us an averaged reading (Vint). We can use these known values (the reading (Vint) and the input voltage (Vinput)) to find the reference (Vref). This value is then stored (as a millivolt reading) in EEPROM, for use by other code. ATtiny25/45/85 have different amounts of EEPROM. (128/256/512 respecively). We will store this number into EEPROM locations 126 and 127. // This loop is not used. This code worked well for me. I used a 1V input measured by a Fluke multimeter, which is pretty accurate. This gave me a reading of Vref = 2473. This meas that the actual Vref in my IC was 2.473V, rather than the 2.56V I had been using, although this is within the specification of the ATTiny. The voltage readings from this device were not accurate and I think this might be the first place to start. I will calibrate all the ICs and the use the Vref value in my main code. When using this code I noticed that a red LED attached to pin 5 (0 on the arduino list) was always lit but very dim. I have since looked into why this is. Note the last part – for the internal 2.56V reference, it is implied that you use an external bypass capacitor on Aref, hence the LED was ‘seeing’ the Vref , which should have had a bypass/smoothing capacitor used. According to the data sheet the bypass capacitor is optional, so we should not need to use a I/O pin to do this. As eventually found within the readme file of this github repository, I found that the definitions “DEFAULT”, INTERNAL2V56″ etc just relate to a number sent to a register. For example the “DEFAULT” sends binary 000 = decimal 0 to the register. “INTERNAL2V56” sends binary 111 = decimal 7 which switches ON the bypass capacitor. Sending binary 101 = decimal 6 sets to internal voltage reference of 2.56V, but with no external bypass capacitor. I have updated the code above to include this. Regarding impedances. Shouldnt divider output impedance be sigificantly lower than ADC input impedance? Otherwise DAC input impedance affects (sags) dividers voltage thus readings are affected.